Our Let Toys Be Toys mystery shoppers looked at stores across the UK to see how toys were presented. 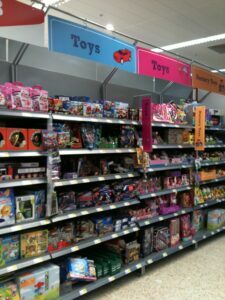 We’re delighted that they saw only two stores using ‘Boys Toys’ and ‘Girls Toys’ signs – both Tesco stores. Tesco no longer use these signs, so we can hope to see these gone soon too. Commonplace in 2012, signs like this have almost completely disappeared. We’ve gone from 50% of the shops we visited in 2012 having these signs to virtually none. Only a fifth (21%) of stores reviewed used gender at all as a way to sort and sell toys online, compared with 46% in 2014, 49% in 2013 and 76% in 2012. This is a drop of over 70% since 2012. Since our 2014 research into toy websites the use of gender to browse and navigate toys has become less prominent, as well as less common. Of 52 toy stores checked, only 11 used gender at all as a way to navigate the site or filter the toys on offer, and only 6 prominently. Many stores offered a wide range of options to view and filter toys by category, theme, character, brand, price, age range etc, and others showcased ways of offering ‘gift pickers’ that don’t rely on assumptions about gender: eg Disney Store, GALT, Great Little Trading Co, Happy Puzzle Co. The Disney Store used to have ‘girls’ and ‘boys’ categories for toys. Now, its gift picker has inclusive pictures and doesn’t rely on gender as a guide to children’s interests. Who’s dropped gender navigation since 2014? Toys R Us, Disney Store and Hut have dropped the option to filter toys by gender. GALT Toys have renamed the ‘Girls Club’ section, ‘Fashion Club’. John Lewis, WHSmith and The Hut have dropped ‘Gifts for girls’ and ‘Gifts for boys’ links. Playmobil and Lego have stopped organising their sub-brands (eg Ninjago, Friends or CityLife, Knights) by gender. Debenhams, Poundland and B&M Homestores used to have prominent ‘Boys’ and ‘Girls’ category pages, and these are now gone. What else can retailers do? ‘Boys’ and ‘girls’ signage may be on its way out, which is really great news. But it doesn’t mean that children don’t see ‘girl’ and ‘boy’ sections any more. Many of our survey respondents mentioned the colour pink as a way that stores continue to tell children that there is a ‘girls’ section’, either by using pink signage or flooring (such as Morrisons or The Entertainer) or by grouping toys together in a de facto ‘Girls aisle’ (such as Smyths, which puts Lego Friends and play kitchens with dolls under ‘Fashion and Baby dolls’). We’d like to see toys grouped by theme or function – such as a ‘home’ section for cooking and DIY role play, or a ‘construction’ section which includes Lego Friends, and for dressing up outfits to be stored together rather than in separate ‘princess/fairy’ and ‘everything else’ sections. Ranges like the DC Superhero Girls make the distinction between ‘action figure’ and ‘doll’ even more artificial: for example Fossil Hunter Lottie has been nominated for the Toy of The Year in the Action Figure category. 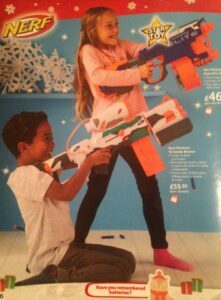 As our research shows, some catalogues still group toys by gender instead of by type, and the manufacturers’ promotional imagery shows children’s play in very stereotypical ways. Children pick up on subtle clues about whether a toy is aimed at them, and the groupings of toys as well as the images used play a strong role. For retailers who create their own images there’s plenty of scope to do it better, as Super U, Toy Planet and Tesco have shown. Find out more about our catalogues research. There are significant improvements in store websites, which is positive news for families who shop online with their children. Those retailers who still use ‘boy’ and ‘girl’ sections or filters risk going against the trend if this isn’t updated in 2017. Shoppers frequently speak of their frustration at having to search two separate sections rather than searching by toy type. ELC was the only retailer to show images of boys with dolls or dolls’ houses in its catalogue, but also one of a minority sorting toys by gender online. This means that toys pictured with boys actually disappear when the ‘boys’ filter is applied. Most retailers commit to an inclusive work environment, but diversity and equality training doesn’t always reach everyone on the shop floor. 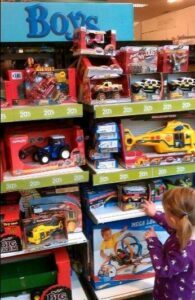 If, despite dropping explicit signage, staff still think in terms of ‘boys toys’ and ‘girls toys’, whether by having separate buyers or by referring to toys in this way internally, this will show up in how toys are displayed and marketed. If inclusion isn’t taken seriously, it will always end up showing on the shop floor.